This was our first time dining at Yak and Yeti. Normally we opt for Satuli Canteen while at Animal Kingdom. We knew it was time to branch out and try something new. We love Yak and Yeti quick service so we figured, what the hey, let’s give it a try. We showed up to Animal Kingdom later than our typical park day and hungry. We were 30 minutes early for our reservations but we figured we would try to get in early. At check in, which was a nightmare, we were told that we would have to wait closer to our reservation time. Not a problem, we were early after all. Well our reservation time came and went, by another 20 minutes, before we were seated. I think a big part of the reason for the delay is the Landry’s Select Club. If you are a local, get it! If you don’t have a reservation you can still stop in and get priority seating. I saw a minimum of five people do this with varying group sizes. It definitely slowed down things for the rest of us but seems like an awesome perk if you are a local. It also is a statement to me about the quality of the food here. If so many locals are dropping in for lunch it must mean good things. The food at Yak and Yeti was truly outstanding. Our waiter made lots of recommendations of his favorites and that’s what we stuck too. 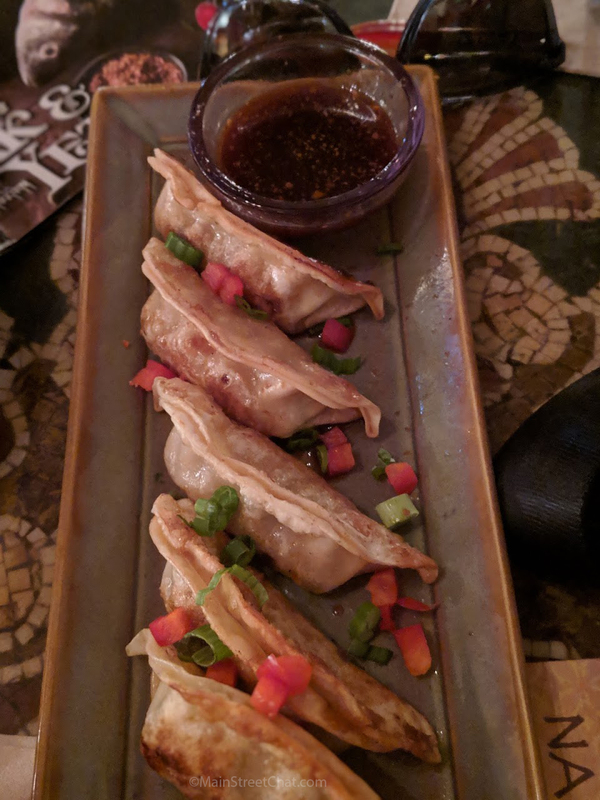 The potstickers were generously portioned and the dipping sauce was soooo good. It was ground pork with ginger and cabbage. Accompanied by a soy lime dipping sauce that was lightly sweetened. The potstickers can be steamed of panfried. We opted for panfried per out servers direction, he didn’t steer us wrong. 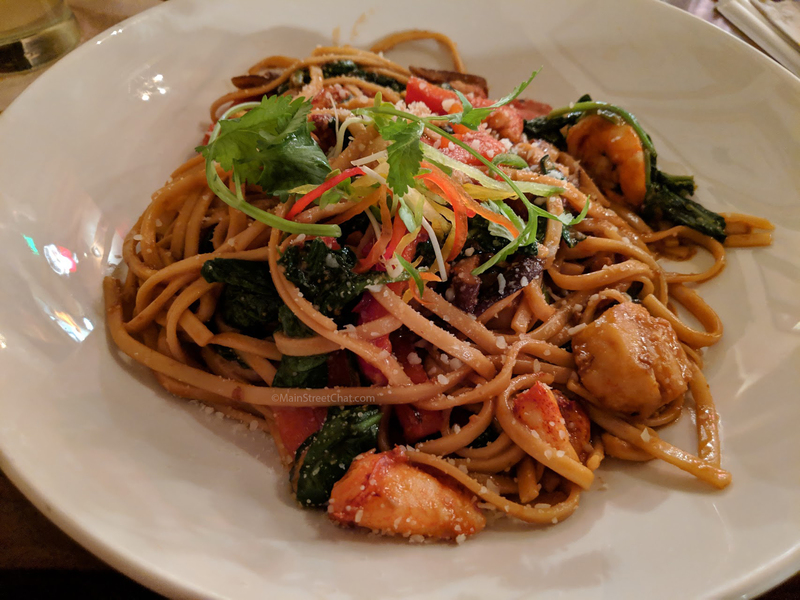 Adolfo got the Lobster Garlic Noodles. This was a giant portion!!!! The lobster was not skimped on at all. Adolfo found a whole chunk of lobster claw in his noodles along with shrimp and scallops. The worst thing we have to say about this dish is that the noodles are prepared in advance. Red bell peppers are a part of this dish, and loathed by my better half. He asked for them to be removed but it wasn’t possible since it was precooked. In addition to the peppers are spinach and shiitake mushrooms. This dish is a little on the spicy side so keep that in mind. All in all this is a huge thumbs up from us. I got the Chicken Tikka Masala. Let me give you a little back story here. 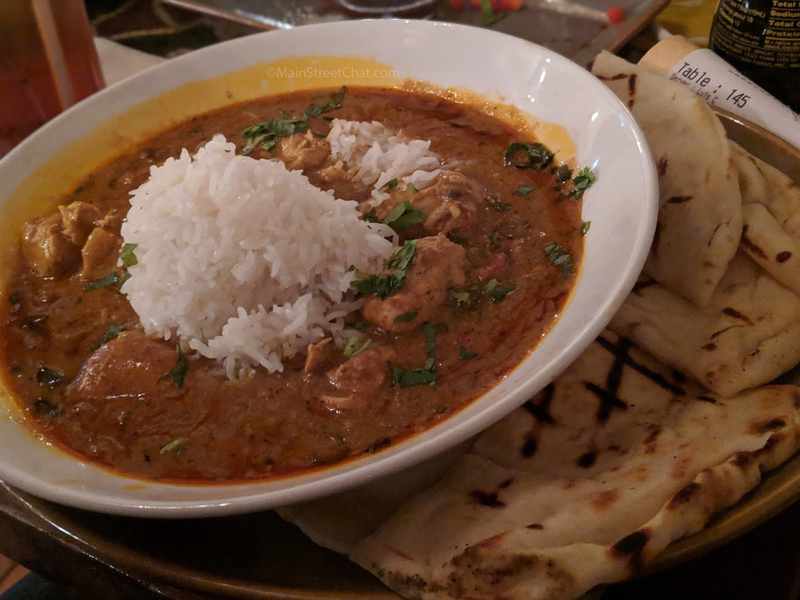 I grew up in California near Berkeley, and beyond the University, there is a huge Indian Food scene. This was everything that I have been missing for the last four years since moving to Arizona. I will be going back for this dish alone. I will never order anything else from here. If you don’t know what Chicken Tikka Masala is it’s chicken breast cooked in yogurt tomato sauce with curry spices. It is typically served with either naan (an indian flat bread) or jasmine rice. In this case, you get both. I was sad that I got full and couldn’t finish this. We ate so much of our main portions that desert wasn’t even on the radar for us. I know we should have controlled ourselves better to give a more complete review but seriously, this means good things if we finished most of our main course. Ok, can I just say props to Yak and Yeti really quick. Their kids menu is pretty extensive and that makes this Momma pretty happy. It made Kaitlyn happy to because every trip she goes on a chicken tender strike half way through. Kaitlyn got the fried rice with broccoli and grapes. 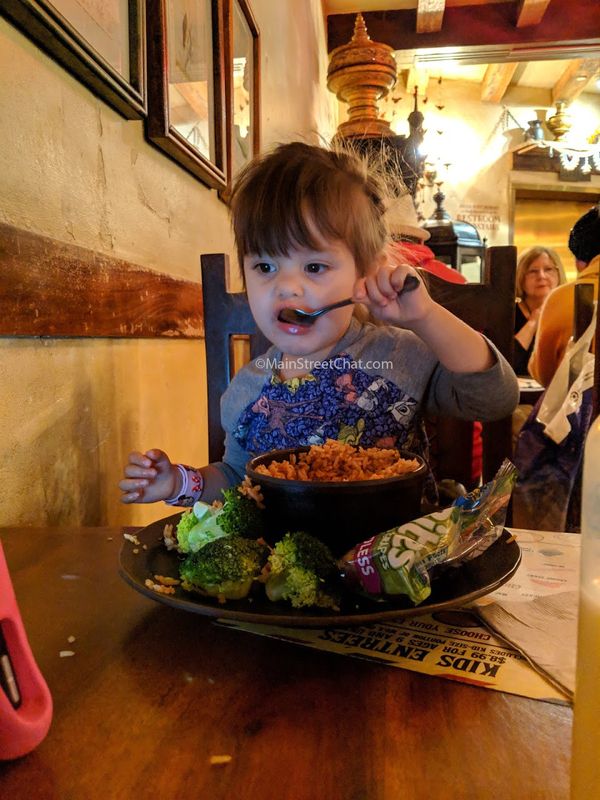 This was easily the most she ate at any meal the whole trip. The fried rice is the same one you will find at the Yak and Yeti quick service but that didn’t bother us any. It’s a family favorite that we get very often. 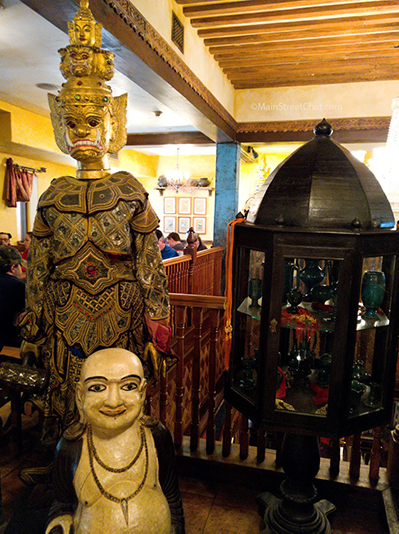 Would we dine at Yak and Yeti Again? YES! The food here is so good and the amount of options are amazing. Do yourself a favor and take your waiters advice. Usually they know what’s up and can tell you what the best items on the menu are. While this is not the cheapest meal on Walt Disney World property we feel that the price is fair considering the portion size. Even Kaitlyn got a massive plate of food. There are a lot of dining options here so check out the menu before you go.